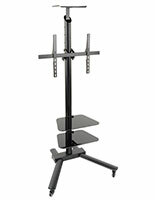 A plasma TV stand, monitor stand is adjustable for easy viewing in any location. 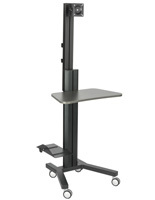 Able to rise from 46" to 68" in height, a monitor stand is perfect for a variety of uses, including business meetings, school educational videos, and even videoconferencing. To raise and lower the adjustable pole, simply loosen the two allen screws and put the pole into position, tightening into place. 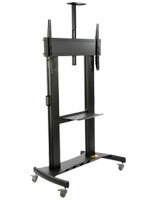 A monitor stand has a VESA compatible bracket that will fit a 15"-27" LCD or plasma television weighing less than 22 lbs. A VESA bracket has been standardized along with manufacturers to fit most televisions and we include (4) screws that fit most televisions. 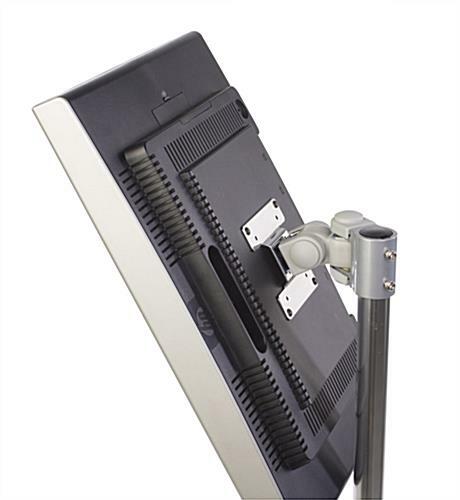 A monitor stand, also known as a plasma television display and an LCD TV stand, has an adjustable bracket to make viewing easy. 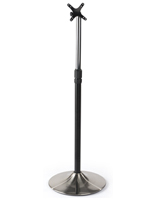 This bracket can be placed anywhere on the pole, giving you many viewing options. 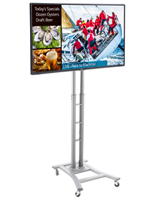 A plasma TV stand, monitor stand can angle your television and also swivels around to provide the best picture view possible. You can also rotate this bracket to change from portrait to landscape view without unscrewing anything! 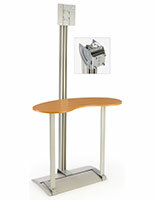 The base of the monitor stand has (5) locking wheels to make transport of your display simple. 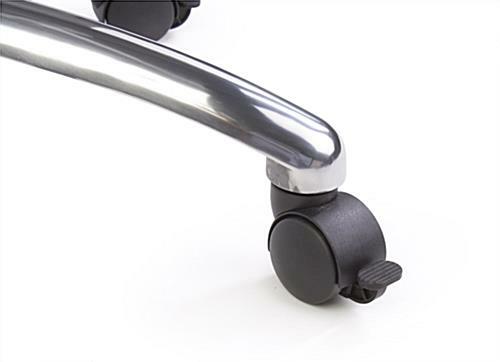 Locking wheels allow you to keep your monitor stand stable once you have it in place. 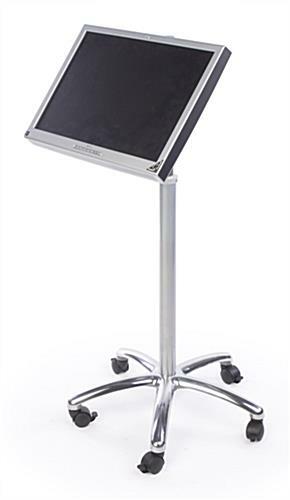 We ship this monitor stand unassembled to save on shipping costs, and assembly with the provided tools is easy and only takes a few minutes. 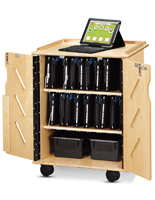 The quality and functionality of this VESA rolling stand was beyond our expectations. We used it to mount an all-in-one touchscreen computer/monitor for interactive and demonstration use. Wow! That's awesome how you used this TV stand to turn your monitor into an interactive touchscreen kiosk - it's such a creative idea. If you post a photo of your new kiosk in-use, definitely tag us on social media — we'd love to see it! Thanks for the great review, Les! great for various monitors, this is our 4th purchase. highly recommend! 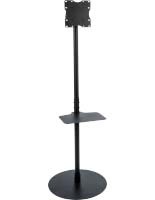 I absolutely love this stand I have a 24 inch tv on this stand in my gym. The wheels roll beautifully on the non slip rubber floor. I can wheel my tv from station to station. Also I have scoured the Internet for months and could not find a stand like this at a lower price, let alone for a 24 inch tv. I do believe displays to go is the only company. This was exactly what I was looking for. Thank you for the review, Adrienne. If you are planning on ordering from us again, feel free to like us on Facebook; we offer various social media-exclusive discounts and deals that you may be interested in for future orders! Extremely well made. Rolls on carpet and or hardwood floors effortlessly. Simple assembly. One thing I would mention negatively is the VESA mounting pattern is NOT as described. The pattern is actually 100 X 100 and 75 X 75 mm. This TV stand is perfect for our TV monitor for reading PowerPoints during video recording. The build is sturdy and the ability to tilt or turn as needed is absolutely perfect.